SPECIFIC Food Allergen Management is a nutritionally complete and balanced dry food for adult cats made with hydrolysed proteins. Ideal for cats with food sensitivities and allergies. What is SPECIFIC Feline Special Care Food Allergen Management dry food? SPECIFIC Food Allergen Management is a complete and balanced dry food for adult cats that suffer from food allergies. The limited number of ingredients and hydrolysed proteins make this diet less likely to cause allergic reactions. The recipe is made with a limited number of ingredients including hydrolysed salmon and rice, which are less likely to trigger an allergic reaction. The increased levels of Vitamins A, E and B complex, along with raised levels of Zinc and Selenium help to support and strengthen the skin. This provides greater protection against environmental allergens. What is hydrolysation and how does this help with food allergies? Hydrolysation is the process where protein molecules are cut into very small pieces. This makes them too small to trigger allergic reactions. This food is suitable for adult cats with food sensitivities and allergies. 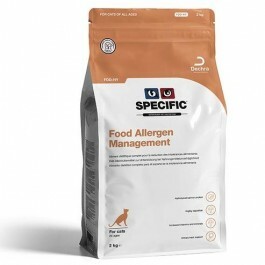 What are the benefits of using SPECIFIC Feline Special Care Food Allergen Management dry food? What is in SPECIFIC Feline Special Care Food Allergen Management dry food? Rice, rice protein, hydrolysed salmon protein (below 3,000 dalton), pork fat, minerals, powdered cellulose, vitamins and trace elements (including chelated trace elements), protein hydrolysate (below 10,000 dalton), fish oil, psyllium husk, taurine. With natural antioxidants (tocopherols, rosemary extract and vitamin C). Crude Protein 27.5g, Crude Fat 12.5g, Carbohydrate 42.8g, Crude Fibre 3.3g, Calcium 0.96g, Phosphorus 0.86g, Magnesium 0.05g, Sodium 0.42g, Omega-3 0.3g, Water 6.8g, Ratio n-3:n-6 1:6. How much SPECIFIC Feline Special Care Food Allergen Management dry food should I feed? The daily requirement may vary depending on factors such as breed, environment, season and activity level. It is recommended that you monitor your cat and adjust the feeding amount to fit their individual needs. How do I know if my cat is the right weight? 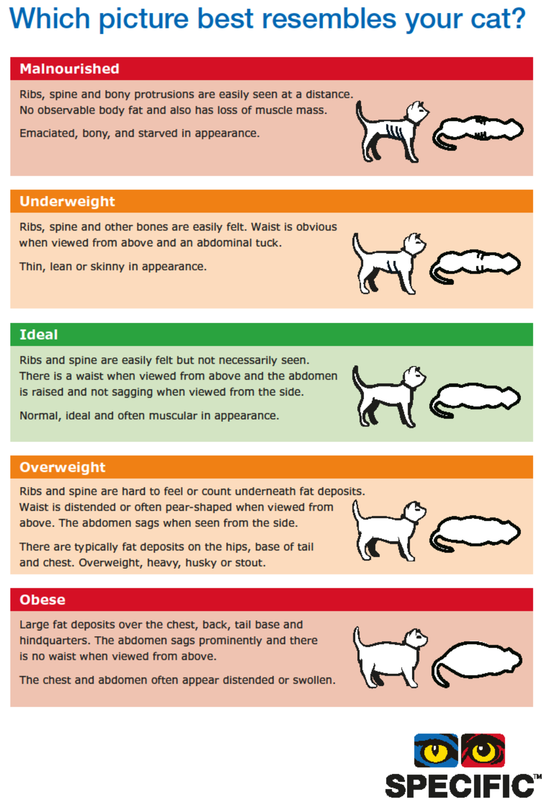 Weight check: Get your cat's body condition checked and weighed. Planning: Work with your vet to decide what is the target weight. 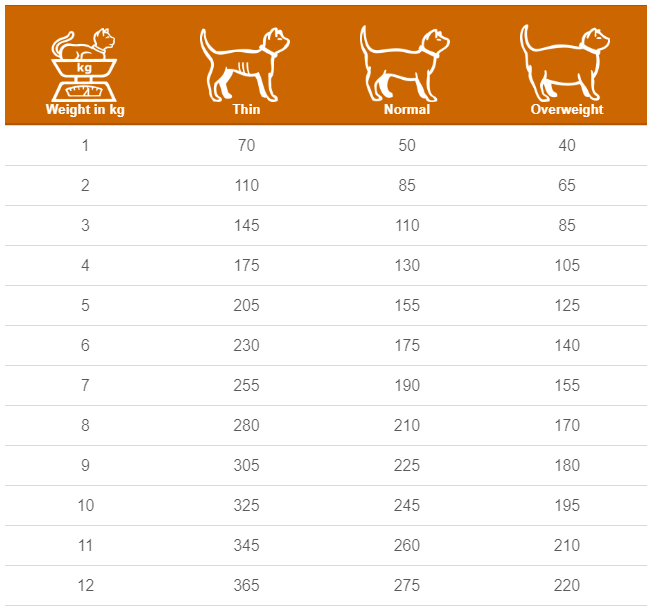 Choose a suitable food for your cat's needs, and then calculate the daily feeding amount. Regularly weigh your cat: A simple way to do this is weigh yourself, then weigh yourself while holding your cat then subtract the two numbers. Be patient– It’s not going to happen overnight but if you stick with it your cat will reach their target weight, and it will all be worth it with a happier healthy cat. Maintain weight: Once you have reached target weight you need to make sure they stay there by choosing a suitable food for your cat's needs. Remember: If your cat is on a diet, be careful not to spoil the good work with treats (especially table scraps), and make sure everyone knows what you are doing!